Damage to Aleppo continues to be catalogued. Palmyra’s Roman Temple . Source: Palmyra Monitor. Daesh have once again begun to carry out mass executions at Palmyra, as reported by the Palmyra Monitor, here and here. New satellite imagery obtained by ASOR Cultural Heritage Initiative demonstrates that Daesh have continued their destruction at Palmyra. The imagery, published on their FB page indicates that they have destroyed most of the Tetrapylon and parts of the ancient theater. 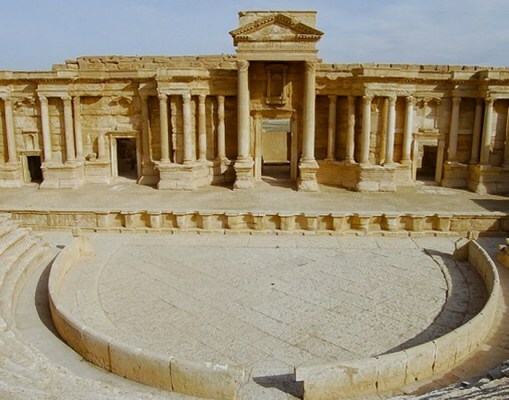 The damage now occurring in Palmyra has been condemned by the Syrian Minister of Culture (here) and be UNESCO (here). “This destruction is a new war crime and an immense loss for the Syrian People and for humanity” stated UNESCO Director General Irina Bokova. UNESCO reported on the extensive damage in the first emergency assessment mission to Aleppo here. Journalists have begun to report on the damage: “I was terribly shaken by what I saw in Aleppo. It became meaningless to ask who was responsible and why.” Fehim Tastekin wrote about his visit in Al-Monitor here. Al-Monitor continues the series of articles discussing the damage here. On 20 January 2017 Aleppo Archaeology posted photos showing Russian Soldiers in the old city of Aleppo. Read more here. On 21 January the Syrian Directorate General of Antiquities and Museums published images showing the damage of different places in the old city of Aleppo. You can read more here and here. North Zealand Police have obtained photos allegedly showing ancient relics that could be sold on the Danish market. Among the items is a Koran that is being sold as one of the original copies of the Islamic holy book, but which experts believe is a fake. You can read more here. (Other than the headline, it’s not clear how they know the items are from Syria). Archaeologists and lawyers who work at the DGAM in Syria and Lebanon have finished the first part of a training course: Preventing the Illicit Trafficking of Cultural Property, which took place in Beirut from Friday 20th through Tuesday 24th January. This first week of training covered legal aspects of the illicit trafficking, and the second week (to occur in February) will focus on law enforcement and the preparation of antiquities seizure and repatriation dossiers. This course has been conceived and implemented by Biladi and the Norwegian Embassy in Beirut. The DGAM also attended the third phase of a follow-up training course for emergency recording and archiving of cultural heritage in high risk zones, which was held jointly between ICOMOS, CyArk, Yale University and the “Emergency Safeguarding to the Syrian Cultural Heritage program”, within the initiative of the “Project Anqa” Programme, and held at the UNESCO Beirut office. 10 trainees from DGAM attended the training, which took place from 16 to 26 January 2016. The training covered practice on 3D laser scanning techniques, using drones, photogrammetry and image processing techniques. Read more here. According to Idlib Antiquities centre the Union was determined after a long series of consultations and meetings in order to launch an initiative for the establishment of (Union of Archaeologists) Idlib branch. This initiative was adopted by Idlib Antiquities Centre. It will include employees and specialists in the field of archaeology, which suffered a lot in these circumstances. The establishment of the Union will be announced soon after a determined meeting. Read more about this here. Numerous news outlets have written on the new destruction in Palmyra: the below are only a selection. SANA wrote about the destruction here and here. The Syrian Directorate General of Antiquities and Museums covered it here. On 20 January 2017 The Guardian published an article about the destruction of the Tetrapylon and part of the Roman Theater by ISIS. ASOR CHI’s Michael Danti discusses the destruction at Palmyra in Travel and Leisure, here. The BBC discusses the executions here, and the destruction here. RT.Times reports on Palmyran destruction and cultural cleansing. The Daily Beast looks at the wars Crac des Chevaliers has witnessed over the centuries, and the damage sustained in the latest one.